From May 21st to 23rd, the BC government and the oil and gas industry are converging on Vancouver to hold a large Liquefied Natural Gas (LNG) summit. In response, the Council of Canadians and the Wilderness Committee are hosting a night of powerful speakers from the frontlines of community resistance to fracking, pipelines and LNG, who will expose the true impacts of extracting and exporting Liquefied Fracked Gas (LFG). It seems the BC Liberals have no pride, they will do anything for the all-mighty dollar and the fossil fuel industry. Now, in contrast to their campaign promises, they are pushing through Bill 24 to change the Agricultural Land Commission which could threaten BC farmland and our food production. A celebration of community, a wonderful potluck dinner and a short AGM at the end of the evening for those who would like to stay. Please Join One Straw Society for a very special afternoon to honour the history of One Straw and Robin Wheeler, to connect with your community and to help grow One Straw Society and launch us into our 20th year of building food sovereignty and community resilience on the Sunshine Coast. Written stories, photos to gift to our 20th Anniversary art project, and/or memories to share at our speakers corner telling your history, and experience with One Straw and the local food movement. A delicious dish of food to share!. Your enthusiasm for building a stronger community. Starts June 22nd and runs every Sunday until September 21st from 11am - 2pm. Held in the commons area at the base of Roberts Creek Road near the Health Food Store. Spring is in full swing at Gibsons Public Market. Freshly planted flowers are coming to life, a fresh coat of paint is transforming the long vacant building, and fresh produce and artisanal products are arriving soon with a new farmers' market. Everyone is invited to attend the Friday Farmers' Market every Friday afternoon until Thanksgiving. The market will feature local fruits and vegetables, wild seafood, eggs, home baking, preserves, and other delicious food options. Other items include local nature photography, gifted jewellers and carvers, and other talented Sunshine Coast artisans. There will be areas for customers to sit and enjoy the atmosphere along with live musical performances each week. A new Market Cafe will appear every Friday inside Gibsons Public Market from 9am-6pm. Come early for breakfast & coffee and scope out vendors as they set up or enjoy lunch after your shopping. Either way, the view from the deck looking over Gibsons Marina is inspiring. Top off the adventure with a stroll through Gibsons Landing visiting a number of shops and art galleries. Come see what's new in Gibsons Landing! Runs weekly until October 29th. Location: Roberts Creek Hall Support local food at the Farm Gate Market. This special farmers market offers some of the best food on the coast. With a mandate to be as organic and local as possible, you can be assured that you are receiving the highest quality of goods. You have opportunities to meet the producers and learn about their best practices to provide you with nutrient dense, reasonably priced ethical food! Contact Market Director Billy Hume for more information. Communities and organizations are calling for a National Day of Action on Saturday, May 10. Coast residents have a choice of various rallies and programs in which they can participate. Locally, there will be a Defend our Climate, Defend our Communities rally in Powell River at 1 pm. at the Willingdon Beach Arena site on 4845 Marine Ave.
Premier Christy Clark announced she will lead her fifth international trade mission. Along with Minister of Natural Gas Development Rich Coleman and industry delegates, she will travel to Malaysia, Singapore, and Hong Kong to promote the development of British Columbia’s liquefied natural gas (LNG) industry from May 2 to May 9. The widest Mountain Hemlock in all of B.C. has been discovered and recorded by Elphinstone Logging Focus (ELF) in an alpine area of Dakota Bowl. The tree is 6.83M (22'4") in circumference. ELF has named the tree the "Dakota Sentinel". The 2nd widest Mountain Hemlock on the list comes in at 5.99M. ELF measured circumferences of 4.47M, 4.77M, 5.18M, 3.9M, and 5.65M in the area. Heights were measured using a clinometer and the crown spreads measured and recorded. These are all top measurements for the species, showing that this site grows the widest Mountain Hemlocks known in BC. The 'Dakota Sentinel' guards over a forest kingdom containing black bear den sites and other massive Red and Yellow Cedars. 'The Sentinel' sits precariously on an edge of a BC Timber Sales cutblock. As the days continue to get longer and warmer, we hope that everyone is taking this opportunity to spend some more time out in their garden. It's still a great time to be planting new seeds and little starts that will grow into beautiful fruits and vegetables for you to enjoy. The 2014 Roberts Creek Arts Festival (RCAF) is a three night and two day, low impact cultural event spotlighting local and international talent, along with local food producers being held on May 17-19, 2014. Thanks for coming to Earth Day! Thank you to everyone who came out for Earth Day in Roberts Creek on Sunday! Your participation is what makes events like that so great. Stephen has been fishing trout for years and has a wealth of knowledge and tricks for catching delicious lake trout. In this class you will learn to set up a line, tie on a hook, bait it and cast. He will also show us how to spin cast. Bring your fishing license, fishing rod and a sun hat for this awesome experience. Directions: Trout Lake is about 12 minutes North of Sechelt on Hwy 101. At the lake you can pull off the highway to park. We will meet at the fishing platform at 11:00 am sharp. To fish in BC you need a fishing license. You can purchase a day license at Trail Bay Sports in Sechelt to attend this class. I hope to see you there. Presented by the Live and Learn Program of the One Straw Society. Funded by Vancouver Coastal Health's SMARTFund. Please join us for some family friendly community planting fun! We will be doing many fun activities at the garden to get it going for the summer season. We will also have Heinz from the live and learn program out to teach us about companion planting! 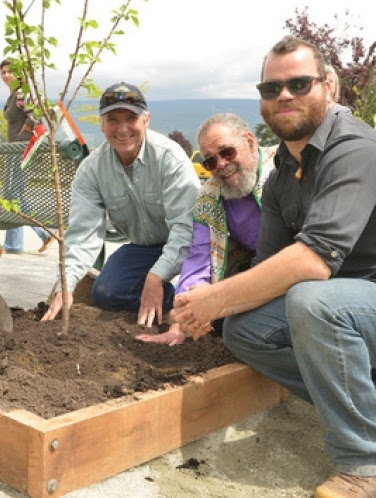 Perry Schmidt, with the District of Sechelt parks department, Don Robb and Chris Hergesheimer officially opened the new community garden near Ocean Avenue on Monday, May 20. 2013. Please join One Straw at the Roberts Creek Earth Day Celebration 12pm - 5pm on April 27th.. Live and learn will have programs running from 1pm - 2pm. You can also find out information on our upcoming events and programming. Sunshine Coast in Transition will be next door also offering some great activities. Hope to see you there! “British Columbia continues to work toward providing energy to Asia’s growing economies. The approval of Triton LNG’s export licence by the National Energy Board is another concrete example of the progress being made to build a liquefied natural gas (LNG) export industry in our province.